"Now, concerning the state of the soul between death and the resurrection—Behold, it has been made known unto me by an angel, that the spirits of all men, as soon as they are departed from this mortal body, yea, the spirits of all men, whether they be good or evil, are taken home to that God who gave them life. And then shall it come to pass, that the spirits of those who are righteous are received into a state of happiness, which is called paradise, a state of rest, a state of peace, where they shall rest from all their troubles and from all care, and sorrow." "Without the gospel of Christ the separation by death is one of the most gloomy subjects it is possible to contemplate; but just as soon as we obtain the gospel and learn the principle of the resurrection, the gloom, sorrow, and suffering occasioned by death are, in a great measure, taken away. "I have often thought that, to see a dead body, and to see that body laid in the grave and covered with earth, is one of the most gloomy things on earth; without the gospel it is like taking a leap in the dark. But as quick as we obtain the gospel, as soon as the spirit of man is enlightened by the inspiration of the Almighty, he can exclaim with one of old—O grave, where is thy victory, O death, where is thy sting? The sting of death is sin, and the gift of God is eternal life, through our Lord Jesus Christ. "The resurrection of the dead presents itself before the enlightened mind of man, and he has a foundation for his spirit to rest upon. That is the position of the Latter-day Saints today. We do know for ourselves, we are not in the dark with regard to this matter; God has revealed it to us, and we do understand the principle of the resurrection of the dead, and that the gospel brings life and immortality to light. We have received the gospel, and if we are true to the principles of that gospel as long as we live, we shall be made partakers of immortality, exaltation and glory." 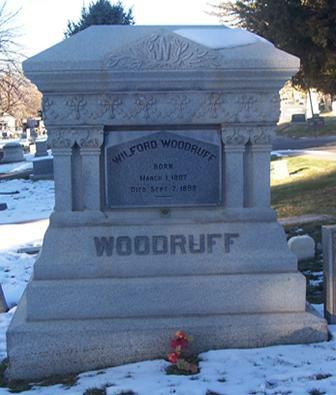 - Wilford Woodruff, June 1875.